The street food offerings are part of the dinner buffet. Three typical street vendor carts have been set up on one side of the restaurant. The service persons with these carts are dressed in white with a cap to boot, as is quite common in Mumbai. On the day I visited the festival, the first stall was preparing Ragda Patty, a popular Bombay dish. It was interesting to see this dish of soft aloo tikki served with ragda and a variety of chutneys and sev being prepared deftly at the stall. 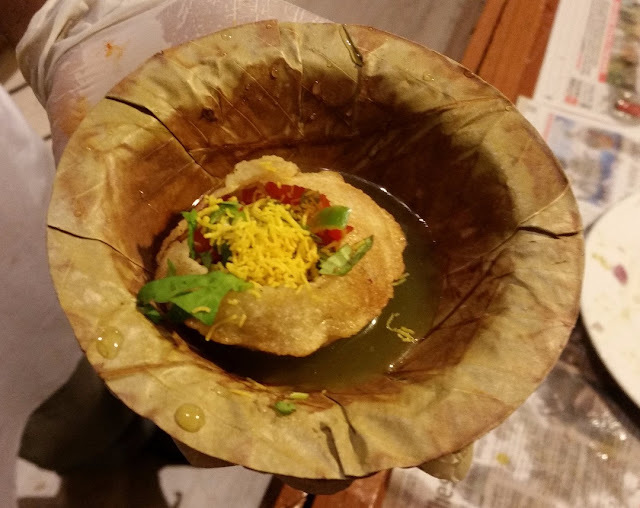 The next stall was the most visited – it was serving Pani Puri. 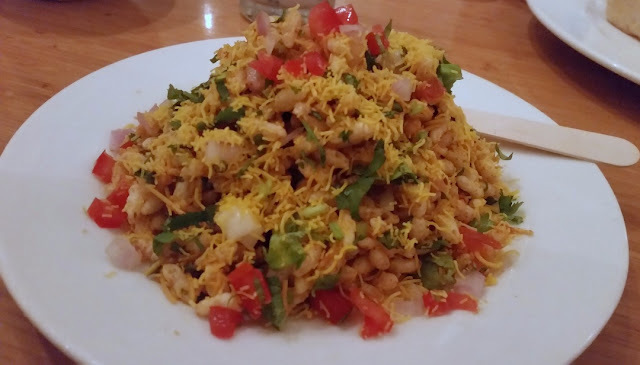 Apart from serving the sweet and tangy versions of pani puri, a whole range of chats like Sev puri and Papri Chaat were being served. Kids from a birthday party nearby were thronging this stall, giving instructions on how to prepare their puris. Ingredients were kept in large glass jars to make it easier for us to select. 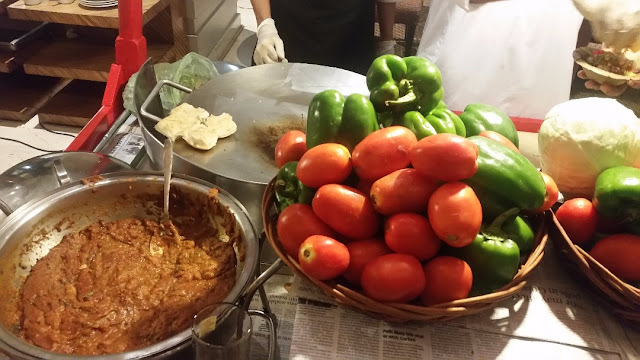 The third stall was for the snack which is “world famous” in Mumbai – Pav Bhaji. 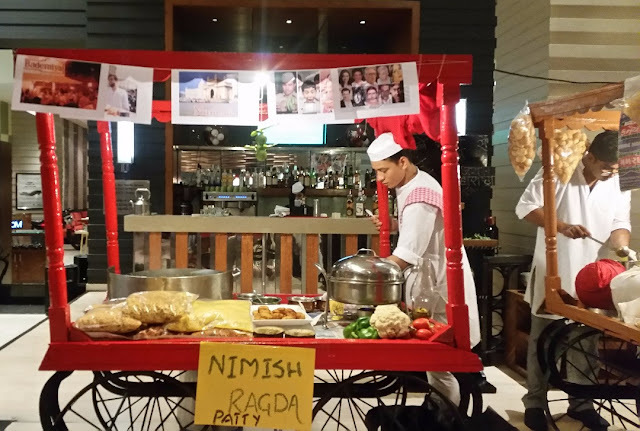 Other popular street food Vada Pav and Bombay Sandwich (vegetable sandwiches flavoured by mint chutney) were also being served here. From the Mumbai Muslim cuisine, Baida Roti (lamb mince inside egg parathas) were on offer today. 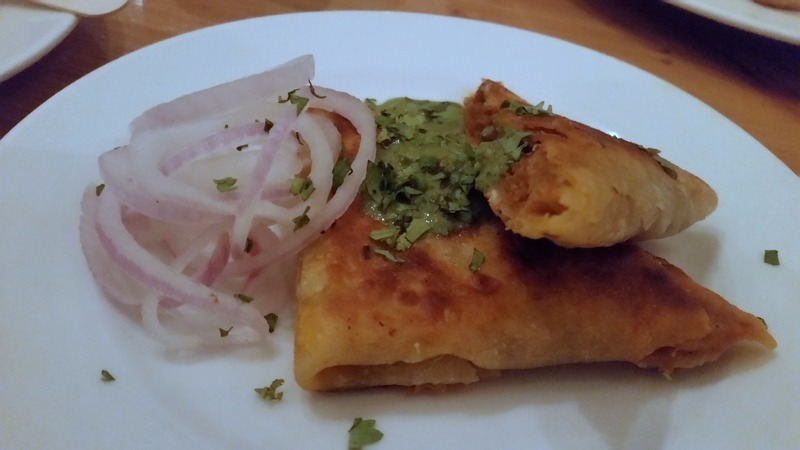 They plan to serve special delicacies like Butter Masala Egg Roll and Egg Malpua (malpuas in sugar syrup topped by an omelette and covered by rabri) on other days. 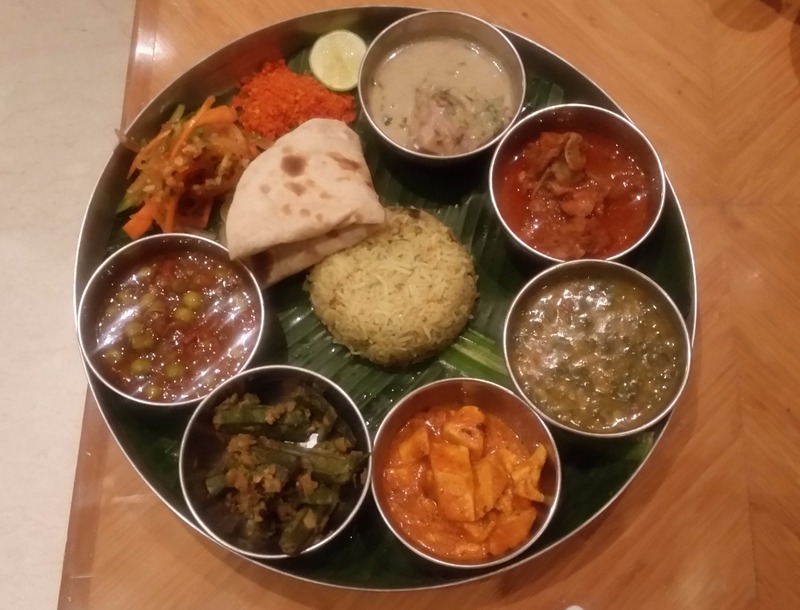 To complement the Mumbai street food, a portion of the buffet has been replaced by Maharashtrian main courses. Even in these main courses, Chef Yogender Pal and his team have tried to showcase the diversity of cuisine across regions of Maharashtra. The chef team had arranged all the Maharashtrian food in form of a well-designed thali, which was a feast to my eyes. There were six Maharashtrian dishes for that day. The Matar Chi Usal, a green pea curry was my favourite from the vegetarian lot, the moderately spicy gravy went well with chapathis. 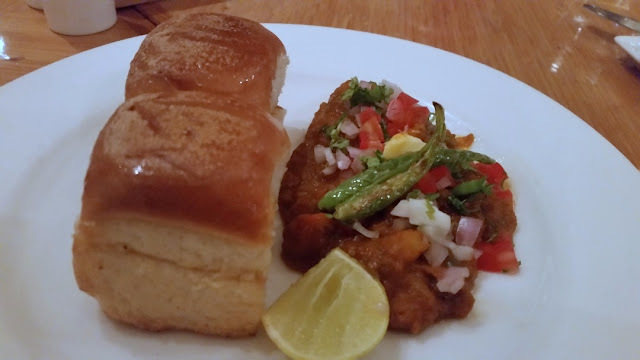 The red coloured Malwani Panner had bite sized masaladar cottage cheese. The other vegetarian dishes were Besanwali Bhindi and Patal Bhaji, a preparation of daal and spinach. Wangi Bath (or eggplant rice) was the rice dish served. The non-vegetarian Lamb Rassa, a Maharashtrian gravy preparation was my pick from the main course, which was a very balanced dish of soft lamb. Pandra Komdi was a yoghurt based preparation of chicken. Though there were various sweets in the buffet, the dedessert-aversee ended my meal with some delicious Shrikhand. 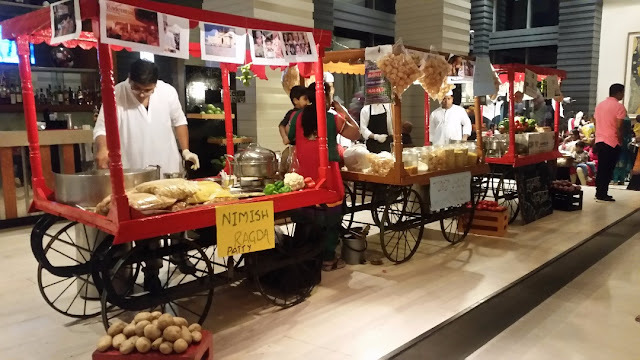 “Treats from Mumbai Streets” is on only till 18th June at Momo Café, Courtyard by Marriott as part of the dinner buffet. 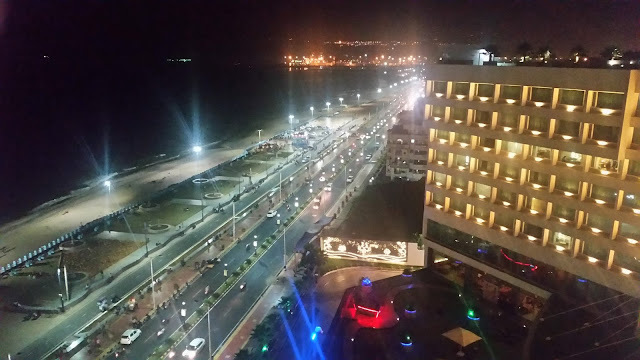 The price of the buffet is Rs 1100 plus taxes.